When Apple introduced its Retina displays in 2012 I was eager to give it a try, but I decided to stay with the MacBook Air line as that whole high resolution thing wasn't ready back then. See my report here (in German). But that truly changed and eventually we're all living in a Retina world nowadays, even if we're using modern Android smartphones. So I knew it would be dangerous to upgrade to a MacBook Pro back in March, because my 29" wide-screen Dell monitor wouldn't bear comparison with its Retina display. After struggling with a decision to go full Retina I finally ordered a 4K Dell monitor two weeks ago. The 27" Dell P2715Q is a good piece of technology – it's colors are good, the viewing angle is pretty good and of course, everything is really sharp and clear. But coming from the Dell U2913WM with a resolution of 2560x1080, the "Retina Full HD" resolution wasn't enough. As people often don't understand what I mean by Full HD in the context of a 4K display: To reach the same kind of quality as Apple provides with its Retina displays, you have to divide the native resolution in half. So even if the P2715Q provides a native resolution of 3840x2160, you can only work with half of it, 1920x1080. Moreover when running the 27" display with that resolution of 1920x1080 everything felt a bit too big. It's like Lego Duplo – sure, it's Lego, but not the original one. 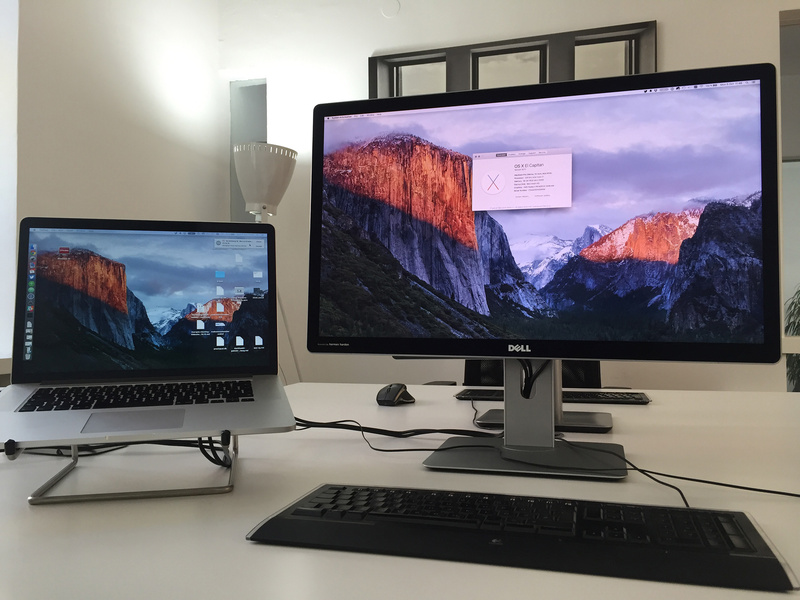 Another option would have been to go with two 24" 4K displays. That's even possible with a 2014 MacBook Pro, as each of the displays would "only" need 17 GB/s, which is provided by the two Thunderbolt ports (Thanks Daniel for the tip). I didn't try that because I am not a big fan of a dual monitor setup (I once even used three, but I never felt comfortable). The 5K iMac has without any doubt a world-class display, as Apple is always manufacturing high-quality monitors. Its resolution of 2560x1440 (5120x2880 native) seems as the perfect solution in both quality and space. But there are a lot of arguments that put it into perspective: I am occasionally working from home or train what would make it necessary to maintain two computers – the iMac and another MacBook. And, as someone told me: A display of that price category should last longer than one CPU generation. I think he's right. As it turned out there was one single option left: The Dell UP2715K, which is a 27" display with similar specifications to the display of the 5k iMac. And it's officially supported by Apple. At least if you're running the latest MacBook Pro (Retina, 15-inch, Mid 2015) with an AMD Radeon R9 M370X graphics card [sic!]. Of course this combination is ridiculous expensive, but it's also incredible good. The MacBook Pro is best in class as everyone knows, but when I first put on that display it just blew my mind. It's so damn sharp, the colors are beautiful, and there is so much space – even more than I had before. It just makes a lot of fun to work with this setup and I don't really regret my "mistake". As I always say: It's like it has been with car navigation systems or automatic dishwashers. If you never used one, you don't miss it. But if you're ever going to try it, you will find it so useful you never want to give it away again.